Whether you’re looking for a few new pieces or an entirely new wardrobe, clothing that looks great and fits beautifully is rarely cheap. Still, there is a source of gently-used clothing that you may not have previously considered, and that’s the local consignment shop. There are also several reasons why shopping at a consignment store might make more sense than you originally thought. Here are ten of the best reasons to stop into your local consignment shop before you head to a major department store. You Want to Go Green – When you buy clothes from a consignment store, you’re snapping up great garments at competitive prices, but you’re also doing your part to help the environment. Rather than purchasing new items and relegating perfectly serviceable ones to a landfill, you’re recycling in a very immediate way. The Budget is Limited – Because clothing at consignment stores tends to be priced far lower than it would be at a major department store or big box retailer, your money goes farther on every purchase. For the same amount of money you’d spend on a single designer outfit at a department store, you could walk out of a consignment store with an entirely new wardrobe. You Want to Support Local Business – With few exceptions, the consignment store industry tends to be populated largely of small, independent businesses. When you’re spending money at a local store, you’re investing in your community and ensuring that small enterprise continues to grow in your area. You Want to Support Other Families – Consignment shops are places where the average person can sell their gently used clothing, surrendering a percentage of their profits to the house in exchange for the provision of a venue and marketing services. Every garment that you buy from a consignment store puts money into the pocket of a local family, helping to support them while supporting local business. To Express Your Unique Style – Some people’s style is embodied by the fashions on the racks of a department store, but those with a more eccentric or creative style are forced to accessorize with items they’ve found elsewhere. 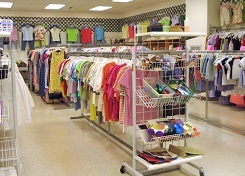 That’s where a consignment shop can make a real difference, because the items on the racks there will be far different from the cookie-cutter fare in a new clothing store. Customer Service is Important to You – Because consignment stores tend to be local enterprises with limited staff, customer service is often more personable and dedicated. When every employee is personally invested in making the business a success, that dedication shows through great customer service and assistance when you’re in need. Brand Name Items at No-Label Prices – Even if you are a designer maven, you’re still likely to score a few choice items at consignment stores. They may be gently used items from a season or two past, but they’ll still be in great shape and bring a designer flair to your wardrobe. Frequent Stock Updates – Clothing comes in and out of consignment stores on a fairly regular basis, meaning the stock is constantly changing. Where you may find the same clothing on the racks at traditional stores for weeks on end, you can rest assured that there will be a regular influx of new items to a consignment store. Convenience – When even the most pressing clothing needs don’t seem to warrant the headache and stress of a trip to a crowded shopping mall or a trek through a cavernous parking garage, a consignment store may be just what you’re looking for. Usually located in small shopping centers or even residential areas, these shops offer a level of convenience that a massive shopping mall simply can’t compete with. You’re Fond of a Good Treasure Hunt – Searching for the perfect gem at the bottom of a bin or the back of a rack in a consignment store is more work than snagging one of several identical pieces from the rack at a traditional store, but it’s also way more fun. Finding that one needle in the proverbial haystack feels like a real accomplishment, lending a level of excitement to the experience that you may not be able to replicate at a department store.